« Day 4 – Looking for breakfast! After a quick cup of tea it was 4pm, time to head out on to the plains. All morning and right up till 3pm the sun was out but as we drew closer to our next game drive the weather changed. Once again the Mara ecosystem was showing us how quickly it could turn. As I loaded our cameras into the van I turned to Godfrey and said “I think we are going to get wet” and as if it was planned, on cue, the heavens opened. It was not good. The rain stopped us from having the roof up and game viewing was going to be almost impossible, but we carried on. As we drove out of camp we turned immediately left on to a dirt track that took us in line with our tent along the Talek River. About 800 m from our tent we stopped. The rain, as quickly as it came, had eased right down to a fine drizzle and then completely stopped. Parked up on the dirt track, Godfrey was scouring the horizon for something of interest. With his eagle eyes he pointed not too far away “lets move, we just move forward a little ok?” he said. He had spotted a hyena kill, it was almost under our noses. We could not see it well due to the tall grass, but in the weather conditions we just experienced, it was a good find. As we sat watching what we could see of the hyena dismember its feast, to our right about 400 m away and in between us and the Talek River, Godfrey had spotted 4 female lions laying in the grass. This was unbelievable, there were only two other guides out on game drives in our area of the Mara, with very few eyes spotting we were convinced we would draw a blank. We knew that not far from the main dirt track there were Topi and Grants gazelle along with a family of warthogs. With the rains starting to fall again, maybe the warthogs would move our way to take shelter in the bush? We formulated a plan! We would sit tight and stay with the 4 female lions no matter what would come over the radio. The air had become cooler and it became perfect hunting conditions. The morning game drive had been fantastic and were in no rush, especially with the rain coming and going to keep driving around the Mara trying to find non-active animals. With a bit of luck the warthogs would want to seek shelter and the only bushy cover would be right where our lions were laying. I could not believe it. After sitting and watching the lions lay in the rain for almost 2 hours, one of the warthogs and a piglet started to head towards the bush. I quickly set up my camera, put my huge lens on a mono pod and slid the front of the lens out of the side window. It was dark and the light was poor quality, but I did not want to miss this. I ramped the ISO settings on the camera up to 2500 to give myself half a chance with a fast shutter speed to freeze any action and waited. 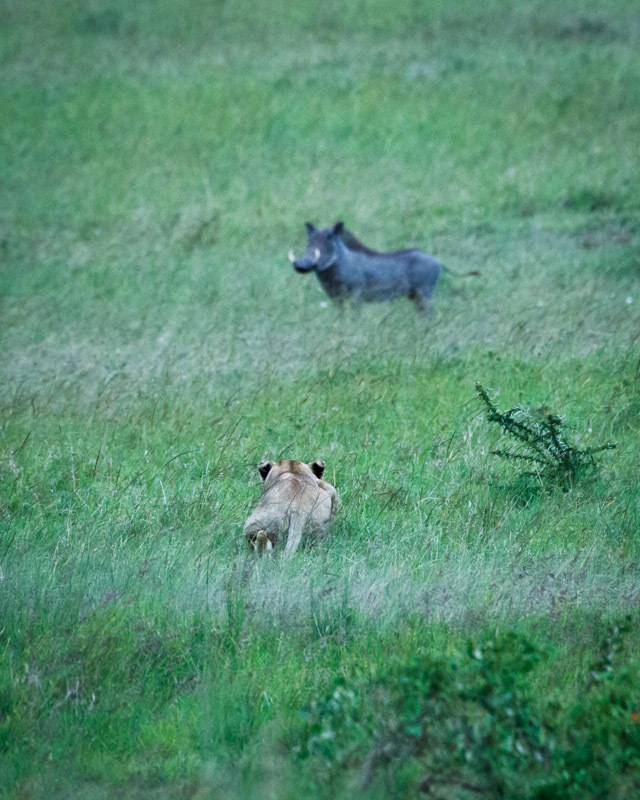 As the Warthogs got closer, the lions spotted them. They immediately saw an opportunity and switched to hunt mode! Low to the ground the lionesses moved in to position. Like a military operation they formed a pincer formation. The warthog was almost in range and one lioness took the lead. You could read exactly what the lionesses were planning. The lead female would creep up on to the side of the warthog, scare it into running forward straight into the path of one of the other lionesses, simple! The trap was set and just as the warthog trotted into position it stopped, the wind had changed and the cover was blown. The warthog could smell the lions and swiftly ran back in the direction it came from… but instead of completely running away, it dived in to a hole. The warthog in the attempt to escape had surely just sealed its own fate? All the lioness now needed to do was wait outside the hole until the hog had forgotten that she was there and as it came out of the hole the lion would catch it! With another twist of fate, the lion that chased the hog into the hole had stopped at the wrong hole. She lay on the ground and with paw and arm thrashing in the hole, she was trying to claw the hog, but in her haste it would be empty. Almost 20 minutes would pass with the lioness trying to get at the non-existent warthog before she gave up, moved away and rejoined her sisters. This would not be the end of the action. Not long after the failed hunt, moving along the river’s edge was the Maasai herders with their cattle. The lions saw the cattle and decided to try their luck. This meant the lions were very hungry, normally lions run away from the Maasai, but when desperate the lions will take their chances. The lions moved towards the cattle, with only two young Maasai as the cattle’s protection the Maasai might lose a cow to the lions. The light dropped and the night was closing in, we were only 5 minutes drive from camp but needed to get back, time was up. Rules of the Mara are that all game drivers must return back to camp by sunset. What a show! Even in the wretched weather conditions we had, the Mara once again showed us its magic. But what would come of the Maasai and their cows? Later that night, I lay awake and could hear the Maasai on the opposite side of the river to our tent. The Maasai stay out all night with their cattle so they can graze on the grass. They definitely had to work hard to keep the lions from killing one or more of their cows!